All the while, Duncan was looking for a cheetah — the world’s fasted land animal — and, by magic as far as I could tell, he spotted one walking up a gentle slope, nearly hidden by tall grass. 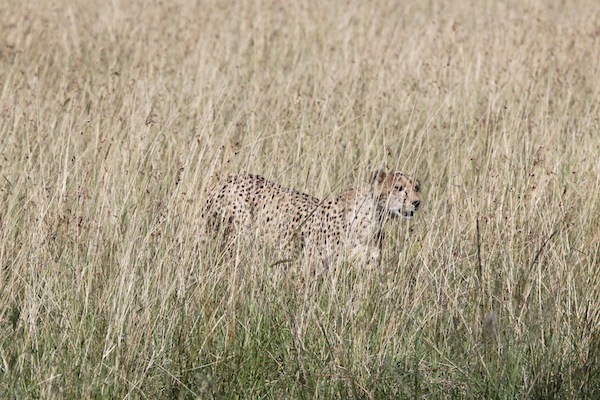 The tall grasses of the Maasai Mara do an amazing job of camouflaging a cheetah. He drove to a point above the animal and we waited for it to walk our way, and it did so, coming up under a tree near us. We could see the animal had a big gash in its left side. Duncan guessed a warthog might have hurt it, but the wound was healing. This cheetah has a nasty gash on her left side, visible here. 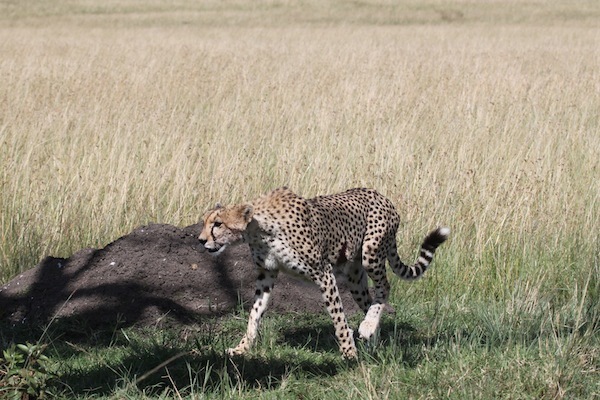 Despite the wound, the cheetah walked as majestically as I would expect of a cat. We collected some nice additional photos before leaving the scene to others. 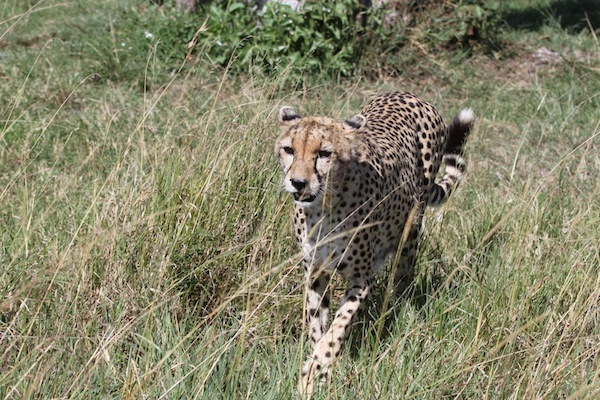 Wounded but regal, this cheetah strides across the Maasai Mara with seeming ease. Typically, driver/guides advise others of a great find, and Duncan had done so in this case. One final thought: I was amazed at how versatile our high-end (and open-sided) SUVs were. Duncan was able to drive our SUV up and down some quite steep slopes, often to drive through a relatively shallow stream or river. He would take us across these waterways through mud on one side or the other, or over rocks in the water as well as on the sides. I would just hang on! !